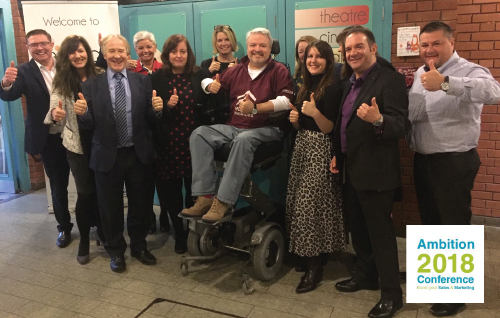 The Muscle Help Foundation (MHF) charity was invited to attend a cheque presentation ceremony held at The Spotlight Theatre (Hoddesdon, Hertfordshire) on 8th January 2019 following on from last years ‘Ambition 2018 Sales & Marketing Conference’. SOURCE: MHF’s CEO Michael McGrath (pictured with Ambition sponsors & partners). The special ceremony was attended by the sponsors and organising committee. 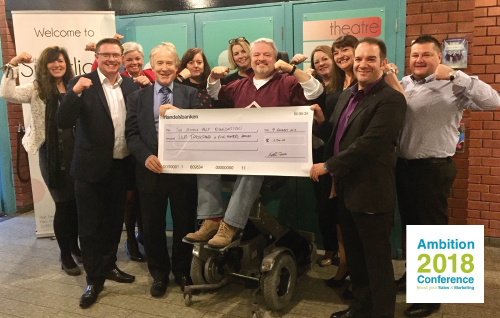 Ticket sales from the event were donated to two local charities, namely the Muscle Help Foundation and The Tamba Bereavement Support Group – each charity received a donation of £2500 for each charity was presented in the form of a big cheque kindly organised by HB Accountants. Ambition 2018 included the following businesses: Andy Lopata, Ashbourne Insurance, Cariad Marketing, HB Accountants, and the Hertfordshire Chamber of Commerce. Sponsors and Partners included: Ambition Broxbourne (Broxbourne Borough Council), Ashbourne Insurance, Austins Family Funeral Directors, Cariad Marketing, Curwens Solicitors, The Hertfordshire Business Independent, The Mercury Newspaper, IT Builder, Mobile Stationery, RiskEye, Via Properties and SWCO Financial Planning. Professional speakers included: David Thomas, Julie Creffield, Bryony Thomas, and Alan Stephens with talks moderated by Jeremy Nicholas. Social media experts included: Cariad Marketing, Rubber Cheese, Mahon Digital. Professional services donated: Alison Jenkins Photography, Creative Star Graphic Design. Ambition is a community event, sponsored and organised by local businesses for local businesses, providing an opportunity to network with fellow professionals from Broxbourne and the surrounding areas.